You may want to turn off Wi-Fi if you're not using it, like if all your devices are using Ethernet cables or when you'll be away from home. Another reason is to improve security or save on electricity. No matter the reason for wanting to turn Wi-Fi off, the steps are fairly simple. However, given that there are so many different devices that use it, you'll want to make sure you identify what it is you want to do before you start turning things off or unplugging power cables. This is what you should ask yourself before you determine the best method for disabling Wi-Fi. Perhaps you can't afford the service any longer or maybe you really don't need Wi-Fi or want the security headache. Consider, too, whether just hiding it from others will solve the problem. First off, realize that disabling Wi-Fi does not absolve you from paying your internet bill. If you're here because you want to disable your internet as a whole, and not just turn off the Wi-Fi signal on your device or network, you should contact your internet service provider. The only way you can stop paying for your internet is to contact the company that you're paying. One example​ of why you may want to turn off/disable your router's wireless signal is if you're not using it. Some homes have no wireless devices at all, in which case having a wireless signal blast through the house for wired devices is rather pointless. This may also apply from the perspective of your phone or laptop. If you're always on a network with slow Wi-Fi, it may be beneficial for you to turn off the Wi-Fi on your tablet or phone in order to use your mobile carrier's network for faster speeds. If you're not using your Wi-Fi, or if you don't need to use it, disabling it may be wise if you're concerned about security. If you have your Wi-Fi on all the time, and especially if you never changed the default SSID or default router password when you first installed your router, it's not that hard at all for a neighbor to access your network by cracking your wireless password. If you want to keep your Wi-Fi on but just have better security, consider changing the wireless password to something more secure and/or blocking unknown devices by setting up MAC address filtering. Another option for increased security instead of disabling Wi-Fi from the router is to disable it from your device. For instance, if you're using your phone or tablet in a hotel or coffee shop and are concerned that someone nearby may be snooping on your internet traffic, you can disable Wi-Fi from your laptop/phone/tablet to make sure that none of your data is being transferred through that network. Maybe you don't want to disable Wi-Fi from your router but instead just hide it so it's harder for someone to connect to your network. To do this, you would need to hide the SSID, which is the name of your network. If you hide or stop broadcasting the SSID, you're not actually turning the Wi-Fi off but simply just making it harder for uninvited guests to find and try to connect to your network. The Wi-Fi settings on some wireless devices are easier to control than others. However, while the options may be slightly different on some devices, the Wi-Fi settings are usually found in a similar place or under similarly named menus. In Windows, you can disable Wi-Fi through Control Panel, which will stop the computer from connecting to Wi-Fi again until you re-enable it. Another option is to disconnect from the Wi-Fi network through the computer icon near the clock - they'll be an option there to choose the network you're on and then disconnect from it. If you have a laptop, you can usually find a physical Wi-Fi switch on the front or side that if turned to the off position, physically shuts off the Wi-Fi antenna, which is essentially the same as disabling Wi-Fi through Control Panel. Again, this needs to be switched back to the on position to turn Wi-Fi back on. On macOS, you can turn off Wi-Fi in the menubar at the top right of your screen. Simply click on the Wi-Fi icon and choose Turn Wi-Fi Off. Some computers also give you the option to quickly turn off Wi-Fi using a key combination, typically involving a function key on the top row. Look around your keyboard for a key that shows a wireless icon, and use either the Fn or Shift key to try turning it off/on. Smartphones provide a software switch in their Settings apps to turn Wi-Fi off. For example, on the iPhone, this is in Settings > Wi-Fi. If you're using a different phone or tablet, look for a similar menu or app, maybe one that says Wireless Networks or Network Connections. 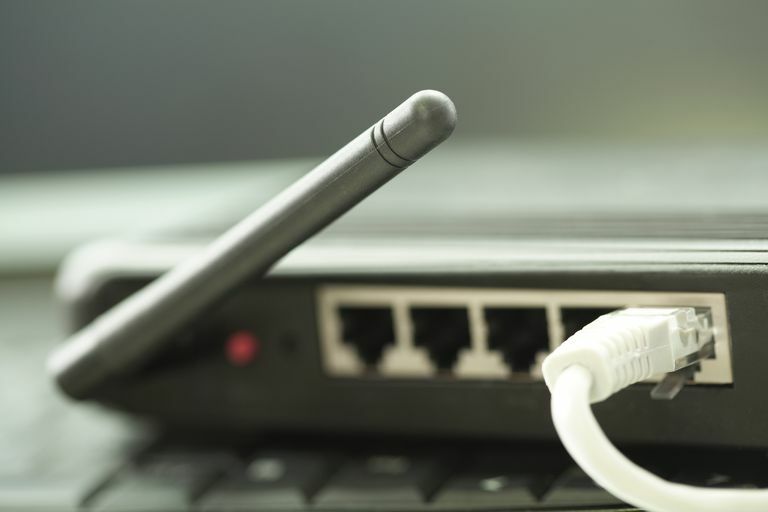 Disabling Wi-Fi from a wireless home router may not always be as simple as doing so from a phone or computer. Some routers have a physical button that lets you turn off Wi-Fi. If yours does, just press it to immediately shut down the wireless signal. If that's not how your router is built, you can still access the administrative console to turn it off but it's not the exact same process for every router. For example, on some Comtrend routers, the "Enable Wireless" toggle is under the Advanced Setup > Wireless > Basic menu. On many Linksys routers, you can disable Wi-Fi as part of the Wireless Basic Settings by changing the Wireless Network Mode to OFF. If your router lacks a built-in feature to turn off Wi-Fi, fully powering down the unit will do so but remember that shutting down the entire router will also disable any non-Wi-Fi functionality like the wired connections. If a computer uses a detachable Wi-Fi adapter (such as a USB stick), removing it disables its Wi-Fi radios. Follow the operating system recommended procedures for detaching these adapters - improper removal can cause data loss. Some wireless routers feature external, detachable antennas. Removing these greatly hinders the ability of the router to use Wi-Fi but does not actually stop Wi-Fi signal transmission. On many adapters and some routers, more advanced configuration options exist to control the transmitter power of the Wi-Fi radios. This feature allows administrators to adjust their network's wireless signal range (often used for reducing power and signal strength when installed in small spaces). If your wireless router lacks features such as the ability to adjust Tx power or perhaps even fully disable Wi-Fi, upgrading the firmware will sometimes enable new administrative options like these. Consult the manufacturer's documentation of the particular router model for details.